Offerings given. Photo by Grey Catsidhe, 2014. 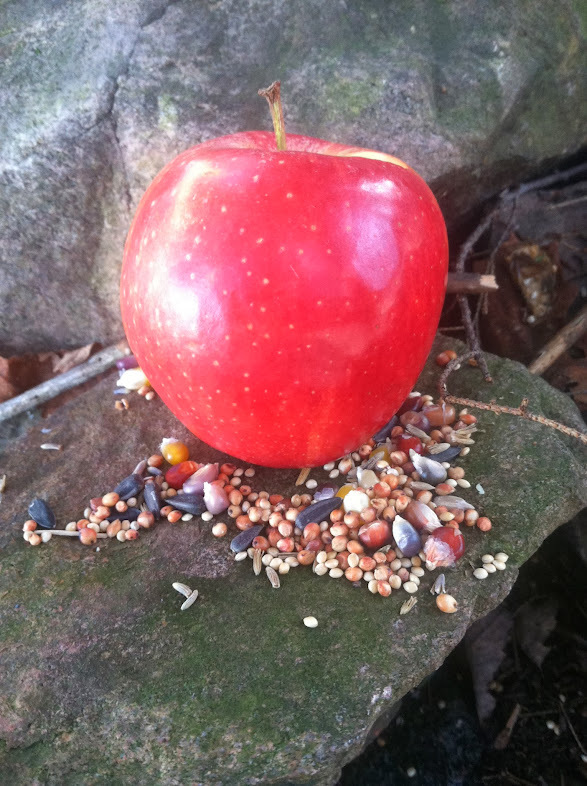 Off to the forest with offerings tucked in my coat pocket, I trudged through the snow. Though much of it has melted, certain areas, especially the places between human dwellings and the forest, are still very deep. Movement was slow and difficult without snowshoes. As always, I thought of my spirit animal, the white tailed deer, as I clumsily made my way. They are so graceful and surefooted in the snow. Were a pack of coydogs to chase me, I would have a difficult time getting away in such conditions. And yet even thinking of deer surviving in the winter gave me strength and renewed my perseverance. As I crossed the hedge, I noticed how the going became easier. The snow was melting faster in the forest. Why was that? Was it because the canopy of evergreens kept so much from piling up so there’s just less there? Chickadees sang happily. I made my way to the shrine, passing some deflated birthday balloons that had blown in from somewhere. I made a mental note to grab them on my way back. As I stepped up a hill towards the shrine, I noted the familiar shapes of deer a few yards away. I stopped and looked around. When you slow down and really look it is amazing what you can see. A whole herd seemed to materialize out of the trees. Some stared back at me, some struck their hooves against the ground, others continued to eat. I proceeded slowly, not wanting to frighten them. This herd and I continue to meet. Do they recognize my coat, my tread, my scent? I held an apple out to them. I did not expect them to come and take it from me, nor do I want to encourage that. I spoke softly, praising them, wishing them well, and telling them my intent. I softly chanted “Fur and Feather”. They ran a little to the other side of the forest. They watched me a moment more, then vanished into the woods as they walked away. I placed the offering upon the shrine, its stones bare of snow. I thought of the deer, admiring their qualities. They are all at once gentle, courageous, persevering, nurturing, cautious, and the females are very tribal seeming. They are good qualities to admire and emulate. 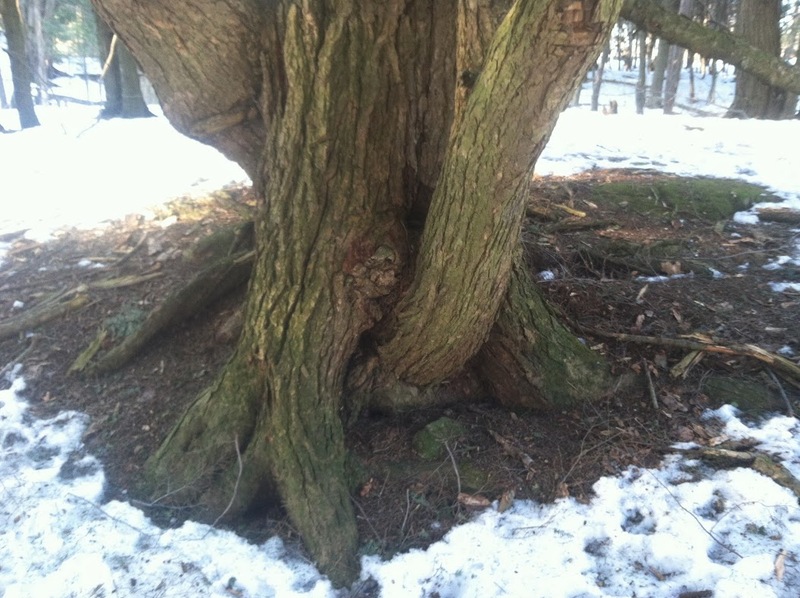 Snow melting around the roots of a big hemlock. Photo by Grey Catsidhe, 2014. Thank you for sharing! I can feel the coming Spring and the graceful, gentle spirit of the deer. Have you shared how you first learned that the white tailed deer is your spirit animal? At first it wouldn’t seem like balloons would be an appropriate thing to find in the forest, but here they seemed very appropriate! I, too, have stood and watched deer just because. I love how graceful they are. There is definitely something about them that I am drawn to.